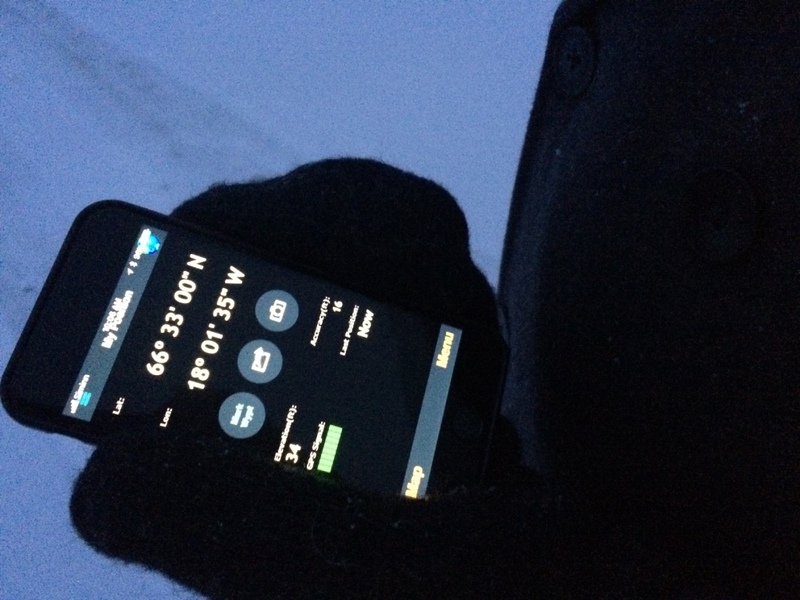 Early to mid-January in Iceland boasts a grand total of 4 1/2 to 5 hours of daylight. 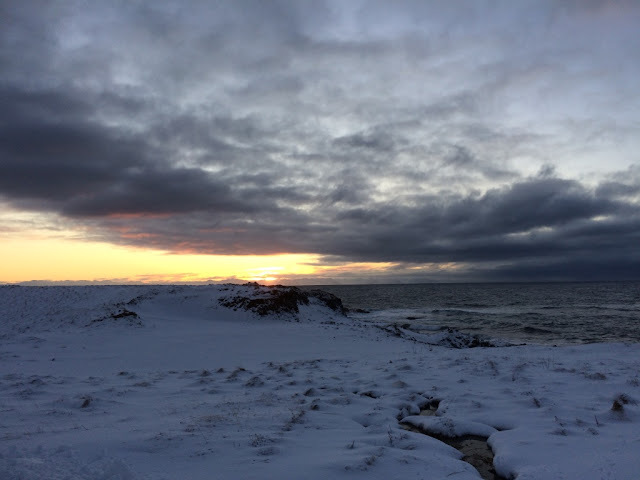 In the north, the sun rises after 11am and sets before 4. It covers a low arc throughout the day. You get a bonus twilight hour before sunrise and after sunset that feels like a real luxury. Most of our trip was purposely in dark, quiet, remote areas. It was a lovely antidote to city life (which I also love, but sometimes you need to recalibrate your personal settings). I was thirsty for wide open spaces that were entirely unfamiliar to me, and I quenched that thirst mightily. If you have to be awake for roughly 27 hours, I recommend this itinerary. We started the day in Bellevue, WA with my gorgeous, precious family (brother, sister-in-law, two nephews and a new niece). Ten-ish hours later we arrived in Iceland, local time 6:30am (body clock time, 10:30pm). We immediately caught a bus to the Blue Lagoon. 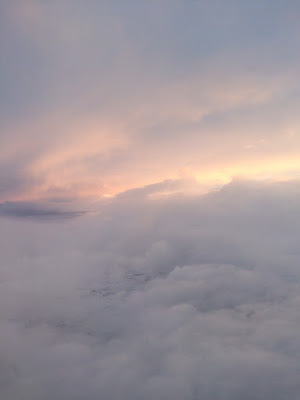 In my opinion, all flights over 4 hours should involve soaking in healing waters upon arrival. 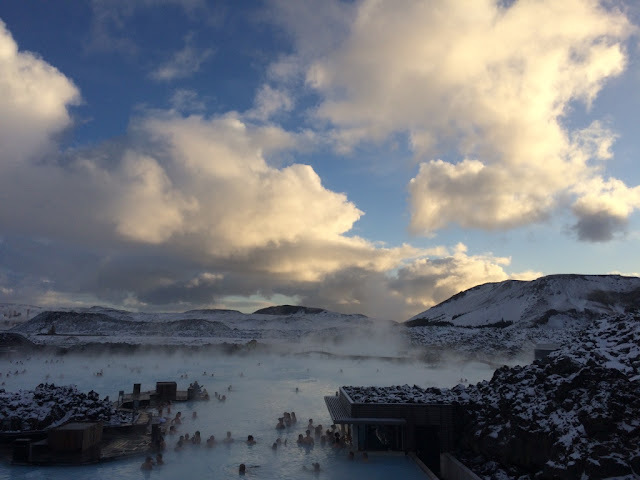 The Blue Lagoon is a tourist trap, yes, but well worth the hassle of having to share it with other tourists, though it took me a bit to adjust to the crowd. When I was there five years ago, it was fairly empty. Their tourism industry has grown exponentially since then. There was a bitter wind cutting our eardrums so we sought out spots with built in windbreaks. We found an ideal corner of the sprawling pools that was not only free from others but at one point hosted a snow shower that stayed entirely in our location. Snow falling on you while soaking in hot water is a heavenly sensation. We soaked, lounged indoors, soaked, lounged indoors, and soaked some more. The morning darkness gave way to steamy light. 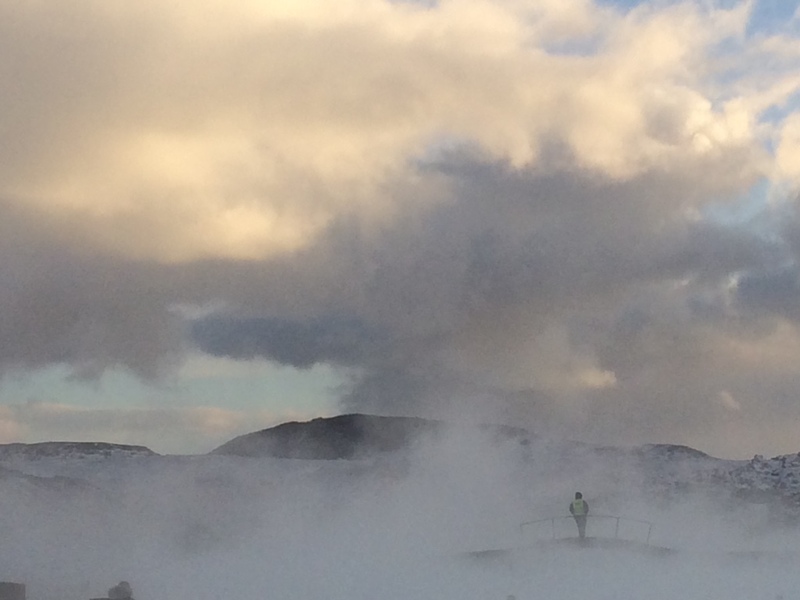 Four hours later we boarded the bus that drove us past lava fields on our way to the Reykjavík domestic airport. I LOVE flying within any country other than the US: check-in and security are a casual, non-stressful affair and mostly made up of locals, it's a great way to see a lot from above that you wouldn't otherwise get to see, and in the case of Iceland, no flights are longer than an hour because it's just not that big of a country. We arrived in Akureyri, the second largest urban area in Iceland (with a grand total of 18,000 citizens) at 5:30pm and retrieved our rental car keys from the man in the tiny Hertz booth. We knew we'd be driving in a lot of snow and ice so we got a 4-wheel drive. What I did not realize we'd rented was a stick shift. I haven't driven a stick in about a decade, and never in the snow. I was about to get real familiar with both fast. 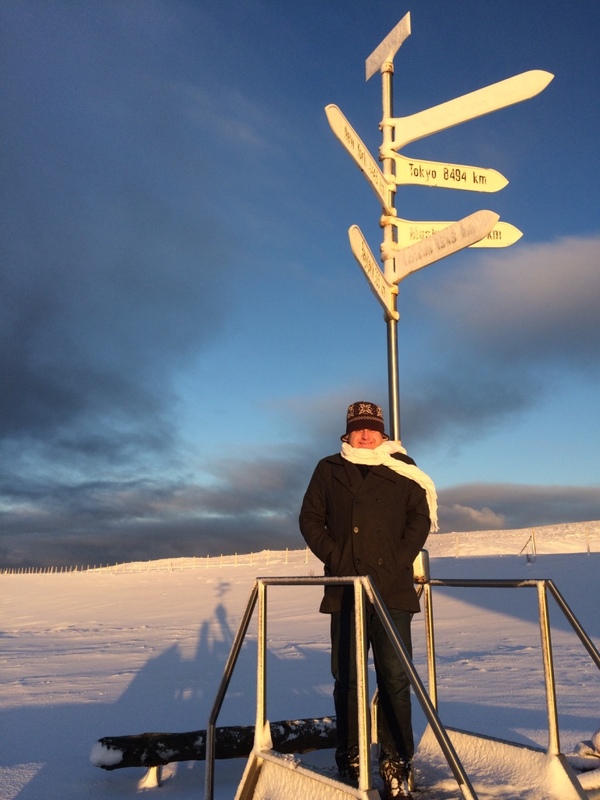 Having been awake at that point for over 24 hours, I was immensely grateful that our hotel (Hotel Akureyri) was a mere 5 minute drive away. We got checked in and immediately walked the three blocks to the nearby restaurant area, decided against any of the high-end spots because it was way more about calorie intake at that point than lingering over a meal, found a fish and chips place (eating out is not cheap in Iceland, so even a single casual plate of fish and chips is $20), inhaled our food and fell into bed as soon as humanly possible after. 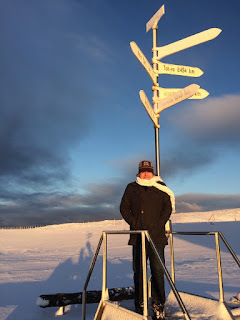 I will say this: if you have to be awake that long it is very helpful for it to be very cold outside, and also to be surrounded by brand new sights; both operate like a caffeine drip. We woke early in the pitch dark, arguing with our bodies about what time/day it really was. The hotel had a delicious breakfast spread (breads and cheeses, hard-boiled eggs, pastries, oatmeal, yogurt, veggies and fruit--including watermelon which seemed very out of place-- and juices) and a judicious application of coffee helped too. We had a date with a ferry in Dalvik (an hour-plus drive away) and set off in total darkness in our stick on questionably icy roads. We made it in time and boarded full of excitement for our quick overnight trek to Grímsey Island. There were only three other passengers. The ferry also carries fish to and from the island, which is useful given the low turnout. As soon as we left the port I thought: oh, right, waves: I probably should've thought to bring Dramamine, but I'm sure it will be fine. I was terribly incorrect about that. I had about 15 minutes (of our 3 hour ride) of feeling well. After that I shivered in the freezing wind, hurling off the side of the boat. I have never been so seasick in my life (and hope to never again) and I deeply regretted breakfast. I got shaky after a while and had to go in because the size of the waves + a shaky grasp seemed like a bad combo. The captain frantically distributed barf bags to all of us - five bags each. I closed my eyes and tried very hard to focus on my breathing, wondering all the while if you could actually die from seasickness. Dan who has never, ever before gotten seasick was similarly felled. We did manage to survive and arrive at our destination, and treaded shakily onto land like newly-born deers. We had expected to walk to the guesthouse we were staying at, but were delighted to find the host was there to pick us up and transport our weakened selves, also promising that "the return trip is always easier," which sounded like a bit of local folklore. Gagga ("like Lady Gaga, but I was first") deposited us at our accommodations and we discovered we were the only guests - we had the whole guesthouse entirely to ourselves. In fact, we were the only guests staying that month (the island only has 35 residents in the winter and about 100 in the summer). We rested, staring out our bedroom window at the afternoon sun shining on the tiny island. There is a restaurant on the island, but it's not open in January so if we wanted anything other than Cliff Bars for dinner we were going to have to venture outdoors. The grocer is only open from 3-4pm each day in the winter. We explored the island a bit then hit the grocer. With 2 other people in it, it was quite the hopping place to be. There are few shelves with very select offerings. We got a bag of fusilli noodles, some sauce, and a bell pepper for vitamins. I think the single bell pepper was over $7. We asked if they sold Dramamine (they didn't) and were told again that the trip back is always better. We feasted, worried a little over the return ferry ride, searched a bit for northern lights but despite prime conditions (new moon plus clear skies) failed to spot any, read a little, and slept soundly in the utterly silent house near the arctic circle. 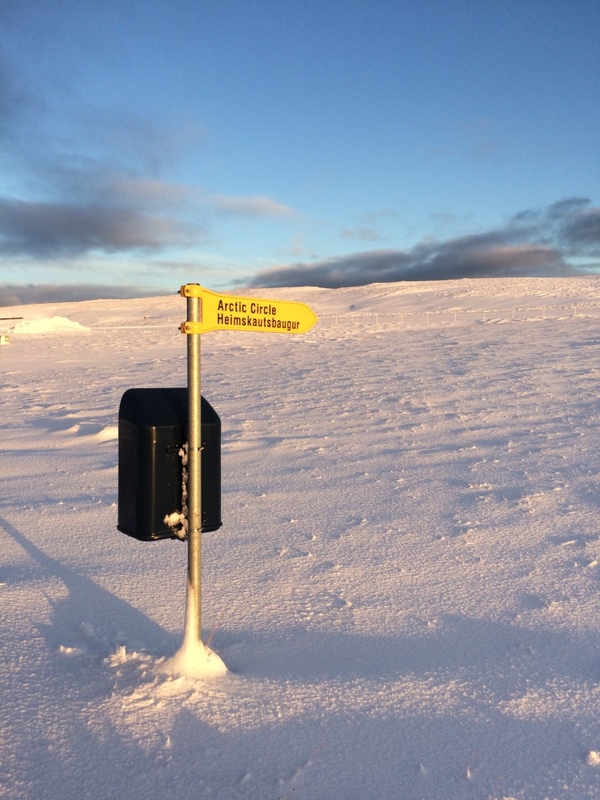 The whole reason we had come to the island was to enjoy its remote beauty and to take in one of its most significant traits: the northern tip of the island crosses into the arctic circle. 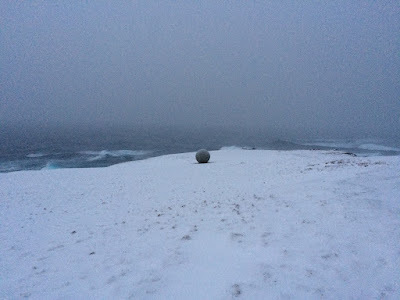 We sought this out the next morning, hiking to the very tip of the island to seek out "the ball." 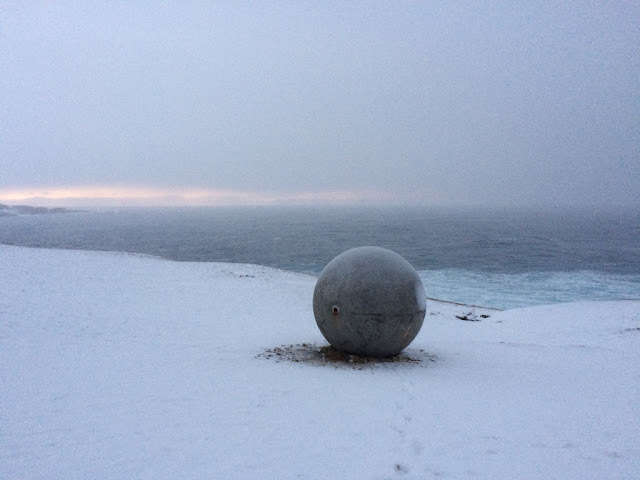 "The ball" is a sphere marker, about 7 feet high, that demarcates exactly where the arctic circle crosses the island. It was just placed there a couple months ago. It's spherical by design so that it can be moved to follow the path of the arctic circle which shifts because the earth wobbles on its axis (a fact I definitely did not remember from my earth science classes). 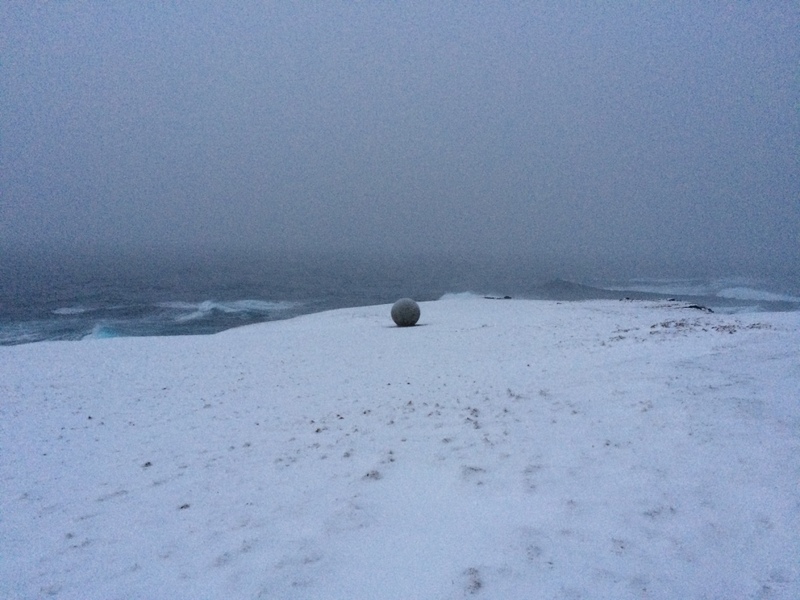 During our 2-hour hike to "the ball" and back we didn't see another soul. 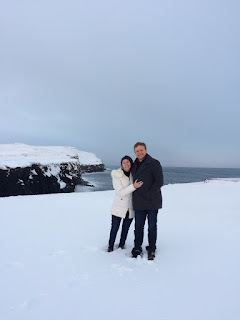 We were the northernmost people in all of Iceland for a spell. The landscape was stunning: snowy, rocky fields surrounded by cliff and ocean. It was sublime. 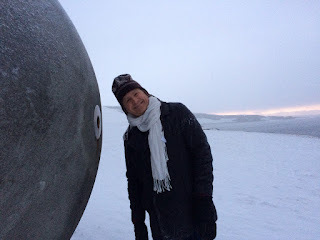 "the ball" up close...it looks like it will roll right off into the ocean, doesn't it? When we returned it was already time for Gagga to pick us up and return us to the ferry. But first she gave us a quick driving tour. 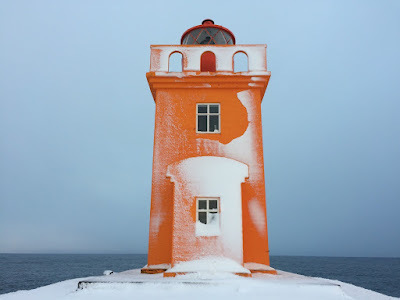 We saw the lighthouse (all lighthouses in Iceland are a cheery yellow-orange, a striking view against the snow), the church (there are only 2 or 3 services per year with the Lutheran pastor shuttling in from the mainland for these), and the one building which is simultaneously the school, library, multi-purpose room (complete with zumba classes in the afternoon), setting for the men's Kiwanis club meetings as well as every celebration on the island, and museum (which houses a small rare book collection gifted by Daniel Willard Fiske, a philanthropist who sailed by the island in the 1870s and was so charmed when he learned of their love of chess that he gifted each household its own chess set). We got to meet all four of the children who are currently students, and both teachers. At a certain age (16 I think), children are required to finish their education in Akureyri rather than on the island. We also learned that you can't really live on the island if you are too old or sick as there's no doctor on the island. We made a stop in the handicraft store (which Gagga arranged to be opened just for us), made some delightful homespun woolen purchases, and stepped on the boat, praying that the locals were honest in their promise that the trip back was easier. We took preventative measures just the same (turns out if you keep your eyes closed the whole time your internal system doesn't freak out about the incongruity of what you are seeing versus your stationary position). The ride really was smoother on the way back (but not without swoon), so I braved the last half hour of the ride with eyes open, and was rewarded with some beautiful views of the fjord we were entering. 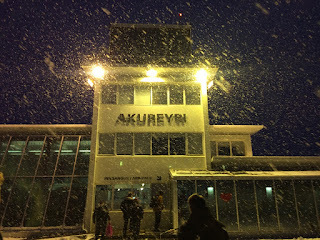 We returned to Akureyri for a strange meal of vegan burgers (my stomach wasn't up for fish) and more deep sleep. I was so excited to wake the next morning and know breakfast would be staying with me.